This category includes taxa that are not quite fully terrestrial yet probably not exclusively aquatic as are most sarcopterygian fish. The animals mentioned below are grouped with the tetrapods because of the development of their skulls and because they possess a generalized set of limbs with digits. The distinction made here between near-terrestrial tetrapods and tetrapods is one of degree: These animals represent an important transitional stage in the evolution of land vertebrates but also appear better suited for life in shallow waters. Ichthyostega (top) and Acanthostega (bottom). Ichthyostega was very much at home in the water, even though it did not have gills. Its limbs were more robust than Acanthostega and its abdomen was fortified with long, thick, overlapping ribs. Acanthostega (Late Devonian). The first fossil evidence of Acanthostega included only fragments of the skull roof that were collected in Greenland in 1933. 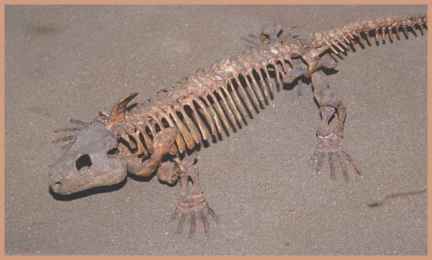 The Greenland specimen was not scientifically described until 1952, when Swedish paleontologist Erik Jarvik assessed it as an early tetrapod. Acanthostega comes from the same geological units that also yielded the tetrapod Ichthyostega, a taxon with which Jarvik was intimately familiar. Fossil evidence for Acanthostega remained scant until 1987, when a joint Swedish-British expedition recovered enough remaining fossil material to reconstruct nearly the entire skeleton. 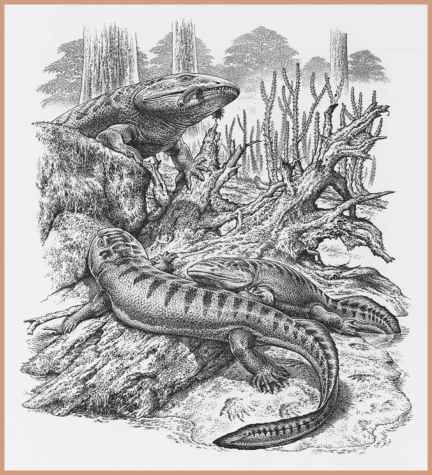 Although Acanthostega originally was thought to be more terrestrial than aquatic, the newer evidence painted a different picture of this basal tetrapod. Paleontologist Jennifer Clack, a participant in the 1987 fossil expedition, has studied the specimen extensively; she characterizes it as an anatomical intermediary between lobe-finned fishes and fully terrestrial tetrapods. Acanthostega clearly had legs and feet rather than fins, but the legs were short and paddlelike. Other aquatic features—including gills, a fishlike spine, and short ribs—strongly suggest that Acanthostega spent most of its time in the water. This recent interpretation of Acanthostega as a waterbound tetrapod has revolutionized scientific thought about the evolution of limbs. Here was a tetrapod with legs and feet rather than fins that probably lived in the water; this suggests that limbs provided an advantage to these animals prior to learning to walk on land. Clack and her colleague Michael Coates suggest that one stage in the evolution of tetrapods was the animals' use of legs to prop themselves up in the shallow water, possibly while lying in wait for prey or poking their heads out into the air. Ventastega (Late Devonian). Another fragmentary but key early tetrapod taxon that languished in museum drawers for years is Ventastega, from Latvia. The fossil evidence consists of a partial skull with jaws and some postcranial elements, including fragments of collarbone, forearm, shoulder, pelvis, ribs, and tail. The skull and jaws are similar to those of Acanthostega, with the addition of paired, fanglike teeth. This is a trait normally associated with fish and suggests that Ventastega may be a more primitive tetrapod than Acanthostega and probably shared the latter's affinity for the water. Unnamed specimen ANSP 21350. (Late Devonian). Another specimen that has figured large in the debate over the development of tetrapod limbs consists only of a single humerus (upper front leg bone). It was found in a fossil-rich site in north-central Pennsylvania known as Red Hill, a road cut where research is conducted by the Academy of Natural Sciences of Philadelphia (ANSP). The site represents a floodplain from about 365 million years ago and includes shallow-channel and channel-margin environments rich with fossils of fishes, plants, and occasional fragments of tetrapods. The specimen known simply as "ANSP 21350" was recovered by Daeschler and an ANSP field crew and described in 2004 by Daesch-ler and Neil Shubin. The three-inch (7.5 cm) arm bone is important because it shows a pattern of ridges to which strong pectoral muscles were once attached, as well as a well-developed elbow joint. These features suggest that this particular early tetrapod could prop its body up in the manner of Acanthostega, though probably mostly in an aquatic setting.